Premium black tea from Sri Lanka flavored with pumpkin and exotic spices. Straight from the jack o' lantern to your cup, this limited edition tea is sure to delight ghosts and ghouls alike. Like the phantoms that haunt your streets, this tea will vanish after Halloween - don't miss out! Premium black tea from Sri Lanka flavored with sweet gingerbread. Both Gingerbread men and women agree: this unique tea is the perfect addition to any house (gingerbread or regular). You'll run, run, run as fast as you can for another cup! Try this limited-time treat. Premium black tea from Sri Lanka flavored with minty candy canes. This wonderfully smooth treat that will fill you with warm Christmas spirit and leave you jolly. Santa knows if you've been naughty or nice, so you'd better buy some for a friend, too! Give our Candy Cane Tea a try before Yuletide's end. Premium black tea from Sri Lanka flavored with sweet, tangy cranberries. This delicious autumn delight is a great complement to your next turkey feast, which your guests are sure to gobble down. Please give this limited-time tea a try-- your teacups will give thanks! A wonderful introduction to the wide range of holiday teas. Each sample makes about 8-10 cups of tea. This set includes (though subject to change without notification): cranberry, candy cane, candy apple, chestnut, gingerbread, pumpkin spice. Not a Coffee drinker but need a hot beverage in the morning? This is a great option for you. Try our extire assortment of delicious hot Cocoas, included in the gift is 7oz of our Trio chocolate cocoa, 7oz of our Caramel praline cocoa, 7oz of our chocolate hazelnut mocha, and 7oz of double chocolate cocoa. Take it with you in our fabulous stainless steel Timbolino travel mug. 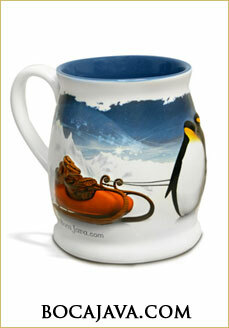 Beautifully designed Boca Java Penguin or Santa Mug holds a whopping 18 oz of your favorite beverage! Some areas of the mug are three dimensional to give texture and a real-like scenery. Wishing You a Java-Filled Holiday Season is scripted on one side of the mug. Penguin Mug: A sleigh and Mom and Dad penguin is on one side and baby penguin with a coffee bean is on the opposite side. 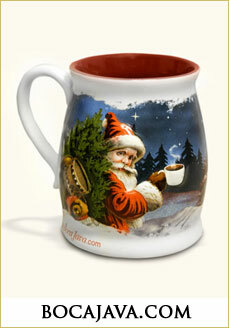 Santa Mug: Santa is on one side and a snow-covered cabin home is on the opposite side. A great gift for anyone who likes to warm up with nice hot beverage in the morning! It should come as no surprise that we understand quality hot cocoa. This indulgent drink was born in our region more than 500 years ago. Mexico's Aztec people were known to crush cacao beans and froth them into a drink spiced with chilies and vanilla. Spanish explorers found Aztec storehouses brimming with the precious beans and witnessed King Montezuma sipping chocolate from his chalice 50 times a day to enhance his virility. Our specialty blend combines dark cocoa with pure cane sugar. The hot cocoa is rich without being heavy and has a silky mouth feel. Sip it with breakfast or as an afternoon treat. Add a dash of chili powder and a touch of vanilla to summon the ancients! Create your own ritual. Add a bag of our new 100% Kona Nightingale. 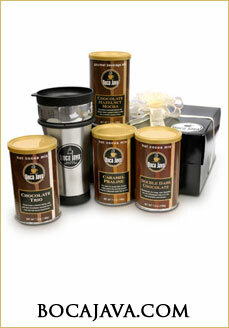 Fill it with a selection of our flavored Macadamia Nut or Vanilla Macadamia Nut coffee. Any of our coffees. You choose. Pricing will be calculated for the unique tin you create. An invitation to relaxation, the ML Spa Tea Gift Box is our take on the traditional tea chest. Indulge in the decadence of artisan-crafted whole leaf tea packaged in a silken tea pouch, our gourmet teabag. Nestled inside are 30 biodegradable tea pouches in the following blends: African Amber Organic, Ginger Twist, Verbena Mint Organic, Jade Organic, White Lotus and Jasmine Mist Organic. Savor the sweet life with our vibrant and festive set of Dolce Vita teas and accessories. Neatly arrayed in our distinctively ribboned deep purple gift box, this colorful assortment is sure to impress. Our unusual bone china and bamboo dessert cups will provide a distinctive tea service for years to come, while we expect our delicious Dolce Vita Dessert Teas will be enjoyed much sooner! The most popular way to buy Tea Forte, the Ribbon Box is the perfect amount of tea to be a great value for entertaining and for personal enjoyment. Our ridged paper box with real ribbon attached makes for elegant table service. Designed to be a perfect hostess gift, each tin contains fifteen Tea Forte silken tea infusers. Five of our best tea blends come in this beautiful, hand printed tin with rich matte colors. Can be kept, refilled, and used for years to come as a Tea Forte serving case. A wonderful gift idea for any tea lover.